Computed Tomograpy; Magnetic Resonance Imaging; ALCAPA. Anomalous origin of the left coronary artery from the pulmonary artery (ALCAPA) is a rare congenital coronary abnormality also known as Bland-White-Garland syndrome. The incidence of ALCAPA is about 1 in every 300,000 live births, and constitutes 0.24% and 0.46% of all congenital cardiac disease. It has a high infant mortality rate reaching up to 90% if left untreated. For many years, the diagnosis of ALCAPA was by angiography or autopsy. However, multislice computed tomography (MSCT) is a non-invasive imaging tool that allows accurate, non-invasive diagnosis of ALCAPA. Here we report a case of ALCAPA in a six-month-old girl who presented with a two-week history of cough, fever, tachypnea, and sweating during feeding. During admission, an echocardiogram was performed that revealed ALCAPA, which was confirmed using CT. We discuss the role of MSCT in its diagnosis. A six-month-old girl presented with a two-week history of cough, fever, tachypnea, and sweating during feeding. On physical examination, the patient was tachypneic (66 breaths/min), tachycardic (170 beats/min) and her oxygen saturation was 100% at room air. Chest auscultation revealed bilateral basal crepitation and a systolic murmur. Her blood workup was normal. An electrocardiogram showed myocardial ischemic changes. Chest radiograph showed cardiomegaly together with plethoric lungs. 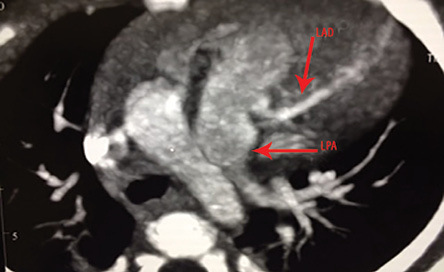 Figure 1: A multidetector CT image shows the anomalous origin of the left coronary artery from the pulmonary trunk, which extends into the interventricular groove as a left anterior descending artery (LAD). The left pulmonary artery (LPA) is indicated. 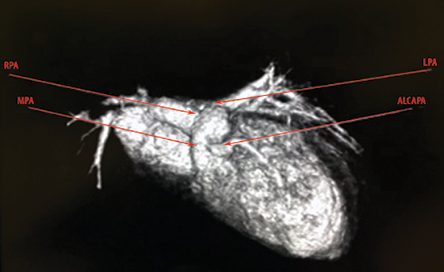 Figure 2: Frontal volume-rendered 3-dimensional multidetector CT image shows the anomalous right coronary artery (RCA) arising from the main pulmonary artery (MPA). The right pulmonary artery (RPA) and left pulmonary artery (LPA) are indicated. The patient was admitted and managed as a case of bronchiolitis. During admission, an echocardiogram was performed and revealed an anomalous origin of the left coronary artery from the pulmonary artery (ALCAPA). The patient was referred to our hospital for cardiac computed tomography (CT) angiography for diagnostic confirmation of ALCAPA. Cardiac CT angiography was performed using a 128 slice CT scanner. The patient’s heart rate was 162 bpm during the scan. The patient was not given a beta-blocker before the CT examination to regulate her heart rate. A retrospective, gated cardiac CT angiography was performed, and reconstruction of cardiac phases from 5–95% of the R-R interval was obtained. In the CT angiograph, the left ventricle was significantly dilated with several calcifications noted at the papillary muscle indicating chronic ischemic changes. On analysis of the coronary arteries, the left coronary artery (LCA) was seen arising from the left side of the main pulmonary trunk and measuring 0.3 × 0.4 cm at its origin. It then coursed into the interventricular groove as the left anterior descending artery (LAD) [Figure 1 and 2]. The right coronary artery (RCA) was noted to arise from the right coronary sinus. The advanced development in cardiac CT and magnetic resonance imaging (MRI) provides noninvasive diagnostic tools for ALCAPA. Multislice computed tomography (MSCT) is a non-invasive imaging tool, and it has an excellent spatial resolution that allows excellent evaluation of small coronary arteries. The short examination time and minimal aftercare make MSCT more practical than conventional coronary angiography. MSCT also plays an important role in delineating the anatomy of the coronary artery before surgical intervention. Different surgical approaches are used for the reimplantation of the anomalous LCA depending on the various origin sites of the anomalous artery (inner wall, lateral wall, and posterior wall of the pulmonary trunk).7 Additionally, cardiac CT may be used as long-term follow-up imaging tool. Surgical intervention is the definitive treatment for ALCAPA. There are several surgical options.10 These include: a) a bypass graft combined by ligation of the anomalous artery; b) the Takeuchi-procedure in which a tunnel is created between the aortopulmonary window and the coronary artery; or c) reimplantation of the anomalous artery into the aortic sinus. Recent studies have shown that the estimated long-term survival at 20 years is 94.8%.11 Our patient had a Takeuchi-procedure; however, a follow-up coronary angiography scan showed occlusion. A second operation was performed, and the left main coronary artery was implanted in the ascending aorta. ALCAPA is a rare condition which carries a high mortality rate if left untreated. Early and accurate diagnosis can be made using MSCT. Unlike conventional coronary angiography, MSCT is a non-invasive diagnostic tool and can be used where MRI facilities are lacking. The aim of this case report is to increase awareness of this condition and to highlight the need for early recognition of coronary anomalies particularly when infants present with clinical symptoms suggestive of heart failure or ischemia. 1. Hauser M. Congenital anomalies of the coronary arteries. Heart 2005 Sep;91(9):1240-1245. 2. Peña E, Nguyen ET, Merchant N, Dennie C. ALCAPA syndrome: not just a pediatric disease. Radiographics 2009 Mar-Apr;29(2):553-565. 3. Kristensen T, Kofoed KF, Helqvist S, Helvind M, Søndergaard L. Anomalous origin of the left coronary artery from the pulmonary artery (ALCAPA) presenting with ventricular fibrillation in an adult: a case report. J Cardiothorac Surg 2008;3:33. 4. Takimura CK, Nakamoto A, Hotta VT, Campos MF, Malamo M, Otsubo R. Anomalous origin of the left coronary artery from the pulmonary artery: report of an adult case. Arq Bras Cardiol 2002 Mar;78(3):309-314. 5. Khanna A, Torigian DA, Ferrari VA, Bross RJ, Rosen MA. Anomalous origin of the left coronary artery from the pulmonary artery in adulthood on CT and MRI. AJR Am J Roentgenol 2005 Aug;185(2):326-329. 6. Alexi-Meskishvili V, Berger F, Weng Y, Lange PE, Hetzer R. Anomalous origin of the left coronary artery from the pulmonary artery in adults. J Card Surg 1995 Jul;10(4 Pt 1):309-315. 7. Cohen MS, Herlong RJ, Silverman NH. Echocardiographic imaging of anomalous origin of the coronary arteries. Cardiol Young 2010 Dec;20(Suppl 3):26-34. 8. Nacif MS, Luz JH, Moreira DM, Rochitte CE, Oliveira Júnior AC. [Anomalous origin of Coronary Artery (ALCAPA) in 64-channel TC scanner]. Arq Bras Cardiol 2010 Jun;94(6):143-146. 9. Takenaga M, Matsuda J, Miyamoto N, Ikushima I, Koiwaya Y. Magnetic resonance imaging of Bland-White-Garland syndrome–a case of anomalous origin of the left coronary artery from the pulmonary trunk in a 22-year-old woman. Jpn Circ J 1998 Mar;62(3):219-221. 10. Dodge-Khatami A, Mavroudis C, Backer CL. Anomalous origin of the left coronary artery from the pulmonary artery: collective review of surgical therapy. Ann Thorac Surg 2002 Sep;74(3):946-955. 11. Lange R, Vogt M, Hörer J, Cleuziou J, Menzel A, Holper K, et al. Long-term results of repair of anomalous origin of the left coronary artery from the pulmonary artery. Ann Thorac Surg 2007 Apr;83(4):1463-1471.